I have chronic fatigue syndrome, now called ME, but when I’m in a bad spell, I’ve overdone it for too long, my body literally shuts itself down and wants sleeep and rest now, even when I’m awake.. And these jerking and twitching is what I get all day, everyday til I step back and recoup & repair my body.which takes a good month of downtime. When the twitching stops, I know my body is recovering from that bad spell aka crash.. I have been trying to figure out what is going on with me for almost 11 years now. This sounds pretty close. It started when I was was about 20-21. I’m 32 now. I would wake gasping for air. It started with once or twice a night. Now, it is all thru the night, and if I wasn’t on Ambien I would not sleep at all. I hate the fact that I’m on Ambien, and would love to get off, but have yet to find anything else that works. I’ve done sleep studies (that told me nothing), tried a CPAP machine, been on Zoloft for anxiety (which I stopped). The gasping has also been coupled with body jolts which cause panic as I wake. This always happens right as I’m falling asleep. Any thoughts? I take ambien as well for the same reason. I don’t take it nightly, but I dislike having it as a crutch. I wish modern science could find something safer. You know, I have more memory of my childhood than the average person. I remember when I started having these, I literally thought I was about to fall off the bed. I was thankful to have them, since it was often true, or close to true. As I got older, it just became a nuisance. Based on this, I pose to you the following hypothesis. Maybe sleeping on beds is NOT something we’ve evolved to do, since it does require a small amount of conscious control over your body in order to avoid falling. I think these jerks are just a natural reaction to the trauma (that most of us have) of having fallen off the bed as children. One way to test this would be to ask in societies where people don’t sleep on beds from which they can fall. Try avoiding all foods that contain wheat and gluten. Try it for a few weeks to see if it makes a difference. Nothing to lose. I started with the jumpiness in January this year. I counted 35 jumps before I fell sleep. I had a sleep study and labs. The only thing that was wrong was I was anemic. I am taking iron and the anemia is gone. The jumpiness was gone for several months taking Clonazepam and Mirapex. A week ago I fell asleep ok but when I woke up in the middle of the night there they were again. Just so happened I had my annual well exam scheduled that week. I was changed to Gabapentin. I was told I could take up to 3 of them, start at 1. Took one at 8:00. Went to bed near 10. Started jumping. Took another slept well. I only got up for the bathroom once which was good. In the morning my head felt like it was all congested my legs and arm were rubbery. Last night I took 2 at 8. Fell asleep ok. Woke around 4 and I had the worse jumping I have ever had. I intend to call the DR and ask if we can increase the old two meds. I think I will try adding some magnesium too. I have literally leapt from my bed and landed on my head before I knew what was happening. I was sleeping on my back every time on the left half of the bed and the leap was always to the left. Luckily there were no sharp objects in the way or I might have been grievously injured. I am glad my skull and neck are still intact. I realised how dangerous it could be and started sleeping on the floor. Since then it has not recurred. I prefer to sleep on the lower berth of a train to be on the safe side. I once had a hypnopompic hallucination while waking up. I saw bright coloured specks on the white ceiling, that gradually faded away. Hello Ethan, I have a hard time grasping how anyone could see the jerk as a problem. I LOVE the jerk. I don’t get it every night. To me, it’s God, whom I may or may not believe in, or maybe my mom or dad, patting me on the head the way they used to do when I was a little girl, and telling me “Good night and sleep tight.” I am then reassured that I am really about to sleep. I feel thankful and I rest. Anyone ever heard of this???? 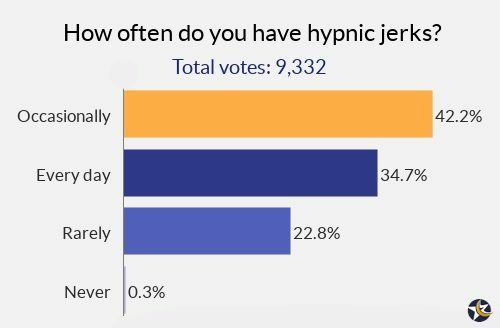 I’ve experienced hypnic jerks many times throughout my life, more so when I was younger, but still on occasion. Most of these have been of the falling-sensation variety and do not bother me for the most part. On occasion though, I have a different experience, maybe somewhat similar to the ‘exploding head syndrome’ described above. It is difficult to effectively put into words, but instead of the falling sensation, I feel a sudden and very acute burst of pressure on my face/head, which in turn jolts me awake. It does not hurt at all but it is very intense, as if I was being hit in the face very hard with a pillow, or a sudden burst of air pressure. As( or after) it happens I feel as if I have been hit in the face with a shovel and felt all of that force, except with no pain or other sensation whatsoever. Large box being dropped Thanks for the info! i have a 8 years old boy that was born with this in 2009 took him abroad to Germany and London when he was 3 thy told that it will go away but still hes having it and more than before but now that he grow up he doesn’t get disturb with it and now my last baby boy also is like this sens birth and its getting worse he doesn’t sleep at nit its driving me crazy ???? Thanks for your comment. I can understand your concern – it’s upsetting when children just don’t seem to sleep well. I’d say though that it’s important to check with a doctor what could be causing it, and especially before giving them melatonin. I self induce a hypnic jerk when I haven’t had enough sleep and feel tired after work. It takes exactly 18-22 mins every time, and I’m incredibly curious about why I can do it and what is happening. I go through different types of sleep disorders. For over a year now I’ve been going through sever episodes of Hypnic jerking. I read some helpful info about how although it is rare in most people, that are certain groups of people where it is fairly common. 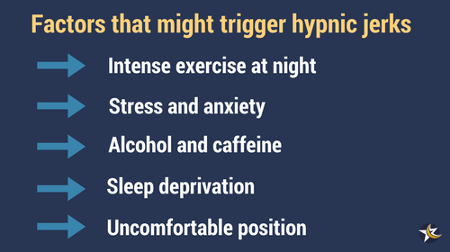 These include people who are reluctant to go to bed until the feel they can no longer keep their eyes open. People who’re afraid of laying awake and worrying, people afraid of not being able to sleep or being woken up frequently, people that have frequent or chronic nightmares, and people afraid of laying in bed and being in pain, like people with fibromyalgia. The cause is because of being exhausted, the brain doesn’t advance through the proper stages of sleep and advances directly into deep sleep, so the brain reacts as if it is going unconscious, and so the head jerks to wake you back up on purpose, as it thinks it is passing out. When I have these it’s usually in morning when the episodes can be so sever that I won’t dream much all night, and then after 8 hours, I’ll wake up and I’ll be so exhausted I’ll go back to bed and then I’ll start a cycle of starting dreams and images before I’m barely even a sleep and wake straight back up, and this will repeat it self over and over while short little 2 or 3 seconds dreams, and this can go on for an hour or two or three, after already having 8 hours of sleep. And I still don’t feel rested. I have had this condition for 20 years and didn’t know until a few days ago what it was. thanx to Mr. Google . Have tried everything i could think of to make this jerking go away but nothing seems to work. Sometimes, a few glasses of wine in the evening seems to help but, probably not a good idea in the long run. Until recently, i thought i was the only one of Earth with this condition as several doctors and two sleep studies came up with nothing. Mine last all night. My entire body jerks. I came off Desipramine . I was on it over 30 yrs. Now im on zoloft…..it seems thats when this all started…..
There’s a new Facebook group called “hypnic jerk support.” Whether you’ve cured yourself of this or are still suffering, come join. We’d love to hear your story. Lezil, it sounds like you are experiencing sleep paralysis with hypnogogic hallucinations. 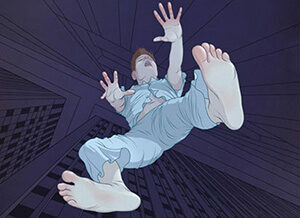 For me, the hypnic jerk is just a quick jolt and that’s it. I have also experienced sleep paralysis with the hallucinations. Those will also usually happen as you are falling asleep. The difference is that the hallucination part of the sleep paralysis does usually happen as a feeling of something evil at your bedside and the paralysis keeps you from moving for a few minutes. I have had episodes when it felt like a demon was sitting on my chest and reaching in to pull my heart out or crush my heart. Very terrifying. I stumbled on some information years ago explaining that the sleep paralysis with hallucinations is essentially your body going straight into REM as you are falling asleep instead of going through the normal sleep stages before you go into REM. Your body does paralyze itself during REM to prevent you from physically acting out your dreams, so that aspect of it is normal. What makes it a problem is that it shouldn’t happen immediately upon falling asleep. I also learned it is more likely to happen if you are sleeping on your back. It helped me immensely to learn that it was an immediate dream state because I am able to recognize if it’s starting to happen and interrupt it by opening my eyes and waking myself back up before trying to sleep again. I also started sleeping on my side, which almost completely stopped it from happening to me. If you are experiencing this, you should probably consult with your physician to make sure nothing more serious is going on and see if there are some treatment options that might work for you. I used to have out of body experiences along with the paralysis, and the presence of evil eventually, where the demons would try to pull me out of my body right during the period of time when I would start to fall asleep until I was asleep. It was very terrifying. I finally received help when I had special prayer that some would call Deliverance, and none of those things happen to me anymore since then. I had unknowingly opened occultic doors in my past, by playing with the Ouija board, watching certain scary movies, or even reading certain books. 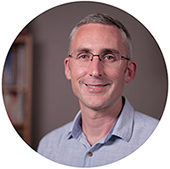 What you need, are born-again, Spirit-filled, believers, who are familiar with spiritual warfare, and know how to pray to close spiritual doors in your life, along with getting rid of demons and their effects. It is amazing what the name and the blood of Jesus can do! 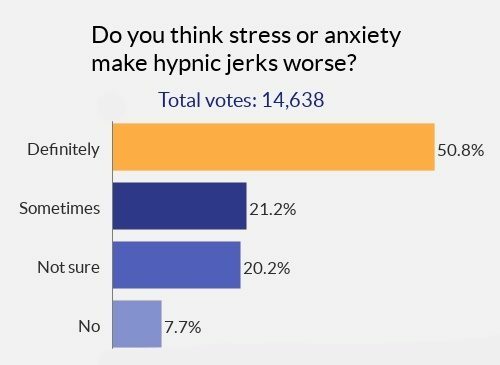 I started suffering from hypnic jerks (in the form of chest spasms and arm movement) back in November of 2016 which initially cause 5 nights of no sleep. My doctor prescribed Ambien which worked for about a month and then resulted in me waking up after 4 hours. Going off the Ambien caused the jerks to return instantly. My doctor prescribed Xanax, which I took for 7 months and had relief. My doctor wanted me to wean of the Xanax and the jerks returned with a vengeance causing insomnia again. Oddly, my blood pressure has always been slightly high (top number at 131 consistanly) and my doctor prescribed a low dose blood pressure med prior to giving me a new sleeping pill After just 4 days on the blood pressure med the hypnic jerks were gone and a weeks later I’m sleeping 7-8 hours per night again. I know this is not the same cure for everyone, but if you have an elevated blood pressure it might be worth talking to your doctor. PS – I also tried every natural remedy and sleep hygene cure prescribed. None of it worked. Thanks for posting! I’m glad that you found something that finally helped you. My blood pressure was in the 130’s also and I also suffer from hypnic jerks. I’m just curious, what is the name of the blood pressure medication that you are currently using that has stopped the hypnic jerks for you? this sounds to me like there might be a ling to hypertension and twitching. Sorry, that comment was meant for Dave not Eric G. Dave, what blood pressure medication are you taking? I started having the jerks back in feb 2017. at first i was startled about what it was at first. i learned to deal with them. i sort of learned to block them by placing a heavy wool blanket over me. that actually worked 90% of the time. until a week or so ago. now last week to now, they came back with a terrible vengeance. 3 days of all night jerks whenever i would try to sleep. no sleep during those 3 days. i was crying cringing and the like. my depression,anxiety, and panic disorders were rapidly worsening and i was lashing out at ppl. lately this has spooked me so much to a point that im afraid to go to sleep. I remember reading or hearing that “falling dreams” were caused by falling asleep with a limb partially off the bed, like having your hand or foot dangling off the side or end of the bed. This disrupts the blood flow to the limb causing the hypnic jerk. Ever since learning this (probably 10 or more years ago) I’m very careful not to fall asleep with my arm over the side of the bed, and ever since then, I don’t recall a single falling dream. I have had these for many yrs. The big one hit lat august and I thought it was a heart attack. I was admitted for testing and everything was normal. The jerks stopped, but in the last week they reappeared. I started to look what had changed. Stress and anxiety have been a problem for me always. I have I insomnia as well. I rotate between klonopin and Valium usually every 60 days to avoid physical dependence. So I am coming off klonopin and have been off 2 weeks now while going back on Valium. My research showed me that klonopin affects the motor part of the brain, while Valium does not. I will be moving back to klonopin much quicker now. Meanwhile I will see a neurologist to find a medicine that can duplicate this effect. After two months of 4 hours/night sleep due to change in mania at start of year, worse sleep deprivation from stress ended in 9 day with 8 hours total sleep (legal paperwork.) July 2012, with other health issues, hypnic spasms *any time I relaxed,* including meditation and sleep, started. Enough sleep and less stress, start of 2014 they were down to almost normal, once in a while before sleep, start of meditation but gone before end. Meditation was very helpful, reduces stress /cortisol that depletes nutrients and interfere with liver etc. functioning. Then my thyroid started improving sending TSH low, thyroid high, but main doc would NOT send me to endocrinologist. Hot summer, hostile move (renovations), a fire, unable to think straight, overheating, loss of money, of things in family (avoidable if thyroid normal) . . .
TSH went to 0.02, 5 months of heart pounding even in the 2-3 hours daily of sleep. When I stopped thyroid, damage had me twitching at any relaxations. Puss un gall bladder, even in public just saying words like love, prayer, meditation, etc. Instead of calling my neurologist, one doctor called security, putting off GB surgery by 2 months. Now GB out, started zinc, spasm free 20 hours, and 51 other symptoms improved, then got weird. Suddenly on “Bicitrate,” light sensitivity, side effects to anesthesia, ammonia in urine as well as shortness of breath *also* reduced. May be helping hypnic spasms too, if only through less stress, less nutritional depletion, less body-induced stress and cortisol, as well as having prop it wasn’t just psych. I’m also on depakote. It depletes l-carnatine (which is how it controls epilepsy – check the PDR – vitamin E, folate, selenium (be ware of overdosing; if you eat meat or Brazil nuts, you may not ever need supplementation beyond vitamin) and Chromium. Stress depletes calcium, and low calcium in nerves leads to grinding teeth, insomnia and irritation. Irritation can happen when your body is short of one of the complex of calcium input nutrients, including major players: Ca, Mg, Zn, MN (manganese is strong in Basil, which cures an odd non-illness scratch throat I get; I carry it with me) and Vitamin D, for me. Any shortage can cause issues: low B5 causes low stomach acid, so many calciums won’t absorb. (My Mom took pre-acidified calcium to deal with this.) All nutrients must be available. I also ate cooked brain. I started dreaming again immediately, and processing my losses from the move, etc. Lots of crying, but less stress. I find cycling types of foods with a baseline of vitamins and nutrients helps, with exercise to slow my hyper-healing, sleeping as well as I can. Along with sleep, one’s specific nutrition needs and exercise, meditation and Chinese exercises, probably yoga (somewhat similar) are what had them almost gone for me, and going away again. Mine almost busted the recliner I was in. Now I can at least safely go in public without fear of having security called on me. I started getting hypnic jerks over four years ago. Tried everything from western medicine to alternative treatments, including acupuncture, somatic experience, brain spotting, emotional freedom technique, massages, chiropractors, ericksonian hypnosis, neurological medicines. Recently the following three things together seems to be making a huge difference so far and very quickly. 3)Using the Ondamed machine which is a biofeedback machine. Not sure if they are really helping me or just a good stretch for me but I feel fairly confident it is the above but not sure which of the three is the most important. But will keep you updated if I continue doing better. No harm in trying at least the first two. Do let us know again in the future if you’re sure it helps, and I’ll add it to the list! Mine happens when I try to fight falling asleep to stay awake few hours before bedtime. When I do go to bed and go to sleep my body jerks to wake up because I did not relax and knowing that it is ok time to go to sleep, I don’t need to fight to stay awake. Jerking is the most embarrassing thing especially in school. Now I don’t always sleep in school but I do during a long test that I finished before the time, or a field trip on the bus. I think the worst one that i’v had was when I jerked myself awake in the silent classroom. Resulting in me loudly passing gas and kicking my leg into the person’s chair in front of me.. I don’t think anyone could top that. i get soo scared when my husband cuddles up to me at night because in less than a few minutes into sleep, his body twitches or moves so rapidly fast, that for example, if his hand or arms is near my faces, i feel like im being boxed … soo i get really hurt in the process of this unbearable situation… and it happens almost every single night..
i feel very bad telling him to sleep on his side of the bed , but this is a worrying factor for me… and really want to know, if his not suffering from anything else other than whats been mentioned from other comments… im really concerned, any help? I take a product called CALM about 30 minutes before my bedtime. It is powdered magnesium. I use just a tiny bit because it knocks me out cold if I use too much. It’s sour tasting so I just use a small amount of water, let the powder dissolve and gulp it down. I hate being jerked awake when I am on the brink of sleep. It’s scary and it really makes me afraid to go to bed. My arms also feel tingly and weird. I wonder if these things are related. 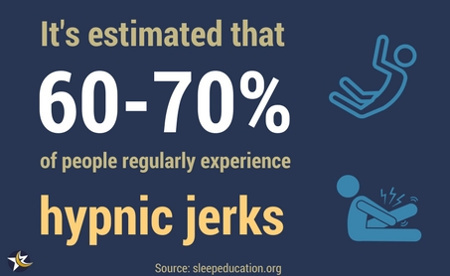 suffering of jerk … its so annoying, it scares me a lot .. i feel so helpless at the point when i face it .. i just went through one and woke up where i ended googling for the solution to get ‘sound sleep’.. lets discuss more on how we can knock them outta life.. I dnno how i can help myself getting rid from this serious problem .. i hate this as I am getting almost evry night these days. I have been doing intense exercise since a month and from that time I have this jerk awaking nights .. I just had one worst jerk and i felt like i will die and woke up .. This is bringing stress in my life .. HELP ! I am an alcoholic and I have.stopped drinking. Since then I haven’t been to sleep. How long will this last? Has anyone else had this problem that saw this article? Thanks for your comment. It is quite common for people to have sleep difficulty when reducing or stopping drinking. Hopefully it will stabilise in a couple of weeks. The useful thing you can do is to try to keep as stable a sleep routine as possible to help your body and mind adjust to a new lifestyle and routine. Also make sure you eat well, and try to get out and do some exercise or go for a long walk during the day. I had 3 nights of multiple hypnic jerks. They were so strong that I bit my tongue and cheeks to the point of bleeding. Then I was too scared and anxious to fall asleep again for fear of hurting myself again. On those nights I had a bad head cold and was taking benadryl. Now that my cold is gone, I am hoping the hypnic jerks are also. I call them “body jerks” because every area of my body has one at one time or another..even my face. It started a year ago when I had an allergic reaction to Armour Thyroid med. I was having the jerks all night long, every time I started to go to sleep…BAM. My body was using the T3 and not storing the T4, within a few months I was in the hospital, where they put me on T4 but I still felt horrible. Just in October I found an endocrinologist who discovered my body was not adequately changing the stored T4 to T3. He started me on a T3 supplement and I have to say they don’t happen as frequently as the used to, but when they do it’s just as bad…all night. They don’t start until around 2 or 3 am, but then are constant. I am very active during the day (yoga, hiking, biking) and am not prone to being “stressed out”. I do enjoy wine at the end of the day, but it is not near to bed time. This has been a long hard year for me, I’m 56 but days like today I feel like I’m 86. I really didn’t know when this started but I started noticing since 2012. I usually feel am falling down from a high building and my leg or hand become paralyzed. I feel for all of you, as this condition can seriously affect your health and mental state. I wish to share with you how I overcame my hypnic jerks. For some reason my jerks only occurred in my right leg, sort of an electrical shock through my right thigh and calf. I’ve used a TENS unit previously to help with minir muscle aches and decided to place 1 TENS pad on my rt calf and the other on my thigh. I selected an impulse setting that closely matched the feeling from the HJ. Since the TENS impulse is so similar to the HJ, it totally masked the HJ shocks and I can now fall asleep. Just the peace of mind that you won’t feel a sudden HJ shock from a calm resting state puts me at ease and allows me to sleep. Please give it a try, if you’re out of options. I noticed that, if I’ve been sleeping more than 8 hours including naps for 2 days in a row, I’m bound to get HJ the following night. If I cut down my sleeping hours to less than 8 hours a day and no napping for a day or two, HJ stops. The problem is, I get blurry vision when sleeping less than 8 hours at night. Either way I still have broken sleep, waking up at least once every night. Feeling tired throughout the day. I’m guessing that HJ is trying to prevent us from oversleeping. 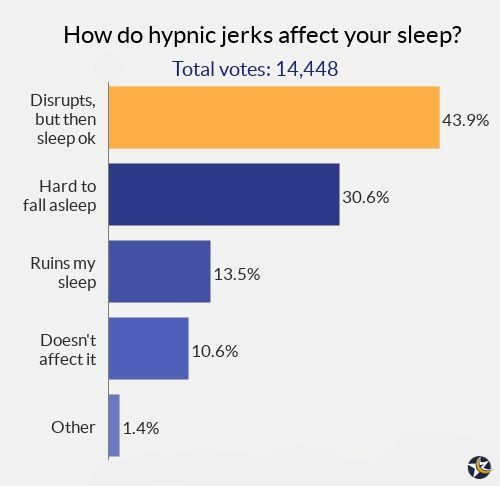 Whoa, I never realised that hypnic jerks could prevent a good night’s sleep. I used to jerk awake in the middle of lectures and can almost be counted on to fall asleep after lunch. In hindsight, it was combo of ignorance about controlling the amount of rice for lunch and also desperately trying to stay awake during lectures. Sometimes I realise I am asleep when I don’t see the lecturer or the classroom. It’s not nice to have this kind of weakness and am looking out for clues and hints to get over it. Glad to hear of others with similar problems.